Panoramic view of the Guggenheim Museum in Bilbao at Nervion river. Bilbao is an industrial port city in northern Spain connected with the Bay of Biskay by the Nervion river. The city is the de facto capital of the Basque Autonomous Community (Basque country). Destination Spain, officially the Kingdom of Spain, one of the two countries situated on the Iberian Peninsula. 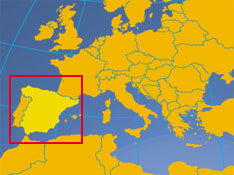 Spain has a coastline at the Atlantic Ocean in north and the Mediterranean Sea in south east. It is bordered by Andorra, France, Gibraltar (U.K.), Portugal, and Morocco (at the Spanish exclaves of Ceuta and Melilla on the North African coast), it also shares maritime borders with Algeria and Italy. Spain occupies an area of 505,992 km² making it the fourth largest country in Europe, and the second largest in western Europe. Compared it is twice the size of the United Kingdom, or slightly more than twice the size of the US state of Oregon. Spain has a population of 46.4 million people (in 2016), capital and largest city is Madrid, Spain's second city is Barcelona, the capital city of Catalonia. Official and national language is Spanish, co-official languages are Basque, Catalan and Galician. Spain is known for its food, Flamenco music and dance, bullfights, horses, arts and literature, architecture, a Moorish heritage, its islands, Mediterranean beaches, wines, fruits and vegetables, and football (soccer). In ancient times the Iberian Peninsula at the southwestern tip of Europe has been inhabited by various ethnic groups. Iberian tribes moved into the peninsula at some point during the second millennium B.C. --whether from north Africa or southern Europe-- and spread out over a broad area. During the eighth and ninth centuries B.C. Phoenicians, Greeks, Carthaginians, and a significant number of Celtic immigrants from central and northern Europe entered the peninsula. This highly diversified ethnic stocks of the pre-Roman period, constituting the ancestors of the later Spaniards. Disparate societies and the tribal organisation of the Iberian inhabitants slow down the conquest of "Hispania" by the Romans, lasting from 218 B.C. to 19 B.C. With the decline of the Roman empire, Suebi, Vandals and Alans took control of parts of Hispania. Followed by the Visigoths, who conquered all of Hispania in the 5th century A.D. and established a kingdom lasting until 711, when it fell to an invasion by Islamic North African Moors. The Reconquista, the struggle among the Christian kingdoms and the Moors lasted until 1492. By 1512, the unification of present-day Spain was complete. During the 16th century, Spain became the most powerful nation in Europe, due to the immense wealth derived from their possessions in the Americas. The steady decline of Spanish power in Europe began in the end of the 16th century, in the 19th century Spain suffered the loss of most of its colonies. With the victory of his nationalist forces in 1939, General Francisco Franco ruled a nation exhausted politically and economically, isolated by the Allies. In 1955 Spain joined the United Nations. 1975 Franco's personally designated heir Prince Juan Carlos assumed the position of king and head of state. Spain joined NATO in 1982 and became a member of the European Union in 1986. Barcelona (4.9 million), Bilbao (353 950), Malagá (1.3 million), Sevilla (1.8 million), Valencià (2.3 million), Zaragoza (871 000). Type: Constitutional Monarchy (Juan Carlos I. proclaimed King 22 November 1975). Constitution: 6 December 1978, effective 29 December 1978. Location: On the Iberian Peninsula in southwestern Europe, bordering the Bay of Biscay, the Mediterranean Sea, North Atlantic Ocean, and Pyrenees Mountains, southwest of France. Climate: Temperate; clear, hot summers in interior, more moderate and cloudy along coast; cloudy, cold winters in interior, partly cloudy and cool along coast. Agriculture products: Grain, vegetables, olives, wine grapes, sugar beets, citrus; beef, pork, poultry, dairy products; fish. Industries: Textiles and apparel (including footwear), food and beverages, metals and metal manufactures, chemicals, shipbuilding, automobiles, machine tools, tourism. Exports - commodities: machinery, motor vehicles; foodstuffs, pharmaceuticals, medicines, other consumer goods. Exports - partners: France 15.7%, Germany 11%, Italy 7.4%, UK 7.4%, Portugal 7.1%, USA 4.5% (2015). Imports - commodities: machinery and equipment, fuels, chemicals, semi-finished goods, foodstuffs, consumer goods, measuring and medical control instruments. Key statistical data of Spain. Catholic church Almudena Cathedral (right) and the Royal Palace of Madrid (Palacio Real de Madrid), home to the Kings of Spain from Charles III to Alfonso XIII. The two institutions that ruled the life of the Spanish for centuries. The Kingdom of Spain is a constitutional monarchy, its government is defined by the constitution of 6 December 1978. The king is the head of state and commander-in-chief of the armed forces. The highest legislative body in Spain is the Parliament, the Cortes Generales, consisting of the Senate (Upper house) and the Congress of Deputies (Lower house). Spain is by constitution (from 1978) a unitary state, a state in which the central government is the ultimate supreme power and the country's administrative divisions exercise only powers that the central government chooses to delegate. The Royal Family of Spain. Moncloa Palace complex, seat of the Spanish Government. The Senate of Spain is the upper house of Spain's parliament, the Cortes Generales. Ministry of External Affairs (in Spanish). The Permanent Mission of Spain to the United Nations. Embassy of Spain, Washington D.C.
Spain's Embassies and Consulates Abroad. Map of Spain showing Spain's autonomous communities and provinces and their capitals. Searchable map and satellite view of Spain. Searchable map and satellite view of Spain's capital. Searchable map and satellite view of Spain's second largest city. Map of the Mediterranean Sea and bordering countries. Spain's third largest national daily newspaper, headquartered in Madrid. Leading daily in Bilbao and the Basque Country with national and international news. One of Spain's leading newspapers with national and international news, its headquarters is in Madrid. Spanish daily newspaper with the highest-circulation in the country, headquartered in Madrid. Catalonia's leading daily newspaper, printed in Spanish and in Catalan, its headquarters is in Barcelona. Spanish daily newspaper and Galicia's paper with the highest circulation. Online shop for prints and original artworks of contemporary artists like Antonio Saura, Eduardo Arroyo, Albert Ràfols-Casamada, José Hernández, Manuel Rivera and many others. Site related to the work of Joan Miró. Site related to the work of Salvador Dalí influenced by Gala. Museum for contemporary and modern art. The Prado Museum - one of the biggest art galleries in the world. A permanent exhibition centre for Picasso's work. A guide to Spanish arts and artists. A virtual visit of the Alhambra at Grenada. Highest Library Institution of Spain and Head of the Spanish Libraries System. The official guide to Granada and the Alhambra. An expanding directory of vintage images of Spain. 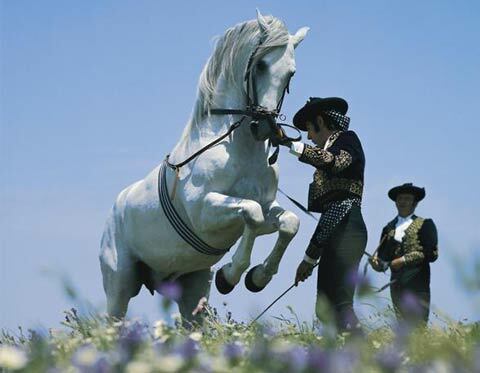 Feria de Jerez is one of the most important celebrations in the Spanish municipality Jerez de la Frontera. Madrid Stock Exchange is Spain's largest and most international exchange. Official website of ICEX Spain Trade and Investment, Spain's Ministry of Economy, Industry and Competitiveness. Madrid's Chamber of Commerce and Industry, the business association was founded in 1887. Spain is the 2nd largest car manufacturer in Europe after Germany. The main manufacturers are multinational companies with subsidiaries and production plants in the country, the largest are Daimler AG, Germany (with a manufacturing plant in Vitoria), Ford, USA (its plant in Almussafes (Valencia) is one of Ford's biggest in Europe), General Motors, USA (with plants in Figueruelas and Zaragoza), IVECO, Italy (with plants in Madrid and Valladolid), Nissan, Japan (Barcelona), PSA Peugeot Citroen, France (Vigo), Renault, France (with facilities in Valladolid, Palencia and Sevilla). The only Spanish automobile manufacturer headquartered in Martorell is a wholly owned subsidiary of the German Volkswagen Group, Volkswagen, Germany (Pamplona). Spanish multi-national engineering and car components company. Multinational automotive supplier, who develops and manufactures interior components for the vehicle industry. Its headquarters is in Burgos. The Spanish banking group headquartered in Santander, the Santander Group operates across Europe, Latin America, North America and Asia. The second largest bank in Spain is multinational banking group formed in 1999 after the merger of Banco Bilbao Vizcaya and Argentaria, itself a former fusion of Spanish public banks. Spain's number three in the financial service sector, a not for profit and charitable financial institution with over 5,800 branches, based in Barcelona. Leading Spanish insurance company, based in the outskirts of Madrid. Spain’s largest energy group, a multinational electric utility company based in Bilbao, Basque Country. Subsidiaries amongst others are Scottish Power (Scotland), Avangrid (United States) and Elektro (Brazil). One of the largest electric utility company in the country, it is a majority-owned subsidiary of the Italian utility company Enel. Endesa has its headquarters in Madrid. Gas Natural SDG, S.A. is a public distributor of natural gas in Spain, Italy and Latin America, the company is headquartered in Barcelona. Spain's only remaining department store chain, ranked number four worldwide. El Corte Inglés has its headquarters in Madrid. Inditex is one of the largest textile companies in the world, headquartered in Arteixo, A Coruña, Galicia. Flagship store is Zara (ZARA), the clothing and accessories retailer, other chains owned by Inditex are the clothes manufacturing company Massimo Dutti, the fashion stores of Bershka, the clothing brand Stradivarius, the clothing and accessories retailer Pull and Bear, the undergarments company Oysho, and Uterqüe, a manufacturer of fashion accessories and garments. Nationwide supermarket chain with a revenue in more than 20 million euros in 2015. Multinational broadband and telecommunications provider and one of the largest private telecommunications companies in the world with operations in Europe, Asia, and North, Central and South America. A major Spanish mobile phone operator and cable TV provider owned by Telefónica S.A..
Spanish low-cost airline with hubs in Barcelona–El Prat Airport and Leonardo da Vinci–Fiumicino Airport in Rome, Italy. Official website of airports of Spain. 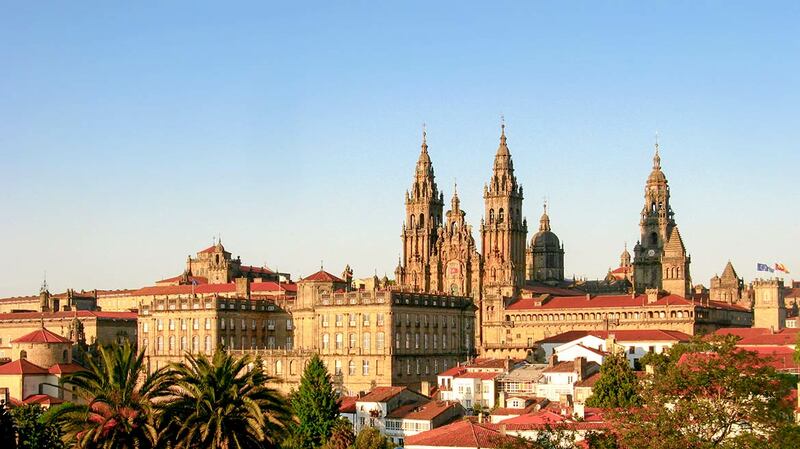 Santiago de Compostela Cathedral, a World Heritage Site in Galicia. Discover Spain: A Coruña, Alhambra, Andalusia, Barcelona, Bilbao, Canary Islands, Catalan rumba, Doñana National Park, fiesta de los toros, Galicia, Madrid, Monfragüe (Extremadura), Santiago de Compostela, Sierra Nevada, Mount Teide, Tenerife. Find accommodation, attractions, festivals, events, tourist boards, tours and much more. The tourist office of Spain. Tourist Office of Spain in New York. Comprehensive travel and tourism information for Spain. A guide to country and culture. A guide to tourism and leisure on Cadiz province. A travel and tourism guide to Seville province. Panoramic view of Málaga from Gibralfaro hill. 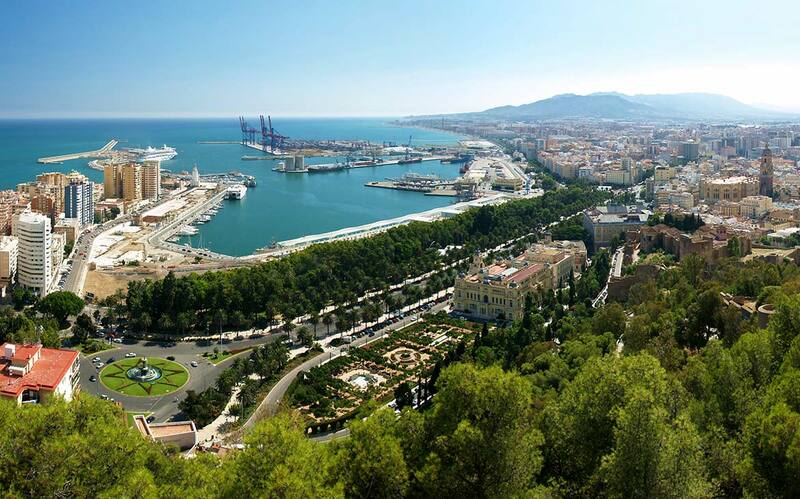 Málaga is a port city and capital of the Province of Málaga situated at Costa del Sol (Sun Coast) in southern Spain. 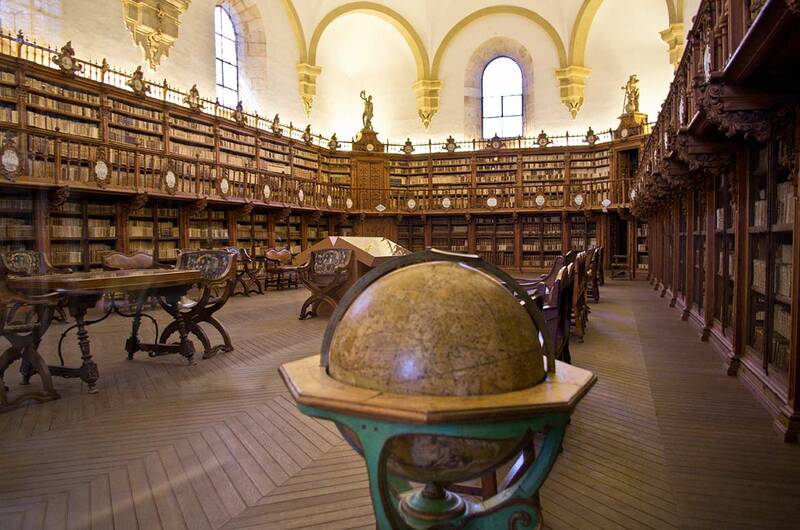 The Old Library in the University of Salamanca, the oldest university in Spain, founded in 1134. University's home page in Spanish. Public university, founded in 1989. Founded in the late Sixties of the last century. Third oldest university in the world in continuous operations, founded in 1134. Multi-disciplinary university with a specialization in the research of technology and science and one of the top-ranked universities in Spain. One of the oldest universities in Spain. 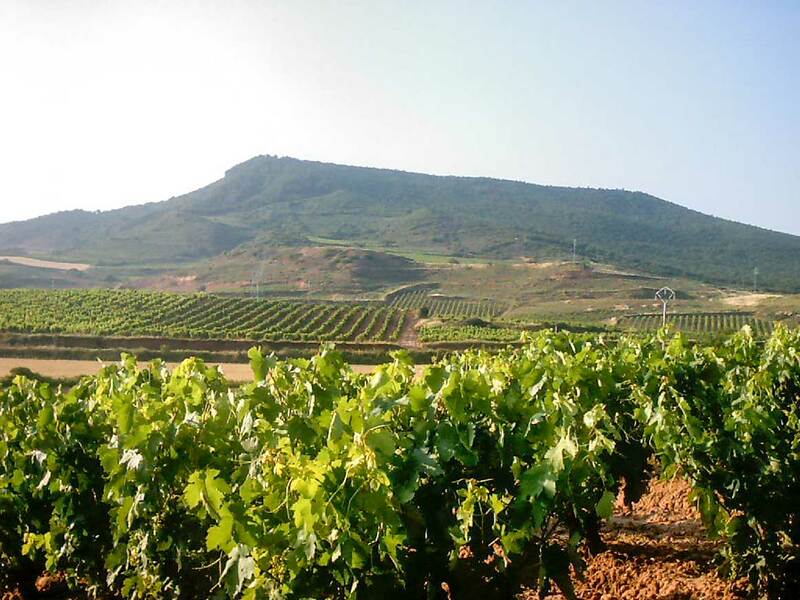 A vineyard growing grapes for Rioja wine, La Rioja, the autonomous community is known for its production of Rioja DOCa wines. Official website of the Environment Ministry (in Spanish). Ecological organization in Valencià Country. The Spanish subsidiary of Friends of the Earth. Information about Spain's 15 National Parks. 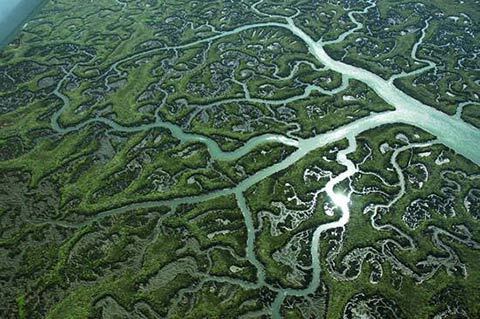 Doñana National Park, the natural reserve in Andalusia in southern Spain is a UNESCO World Heritage Site. History of Spain and Portugal from ancient times until the 17th Century, by Stanley G. Payne, a historian of modern Spain and European Fascism at the University of Wisconsin–Madison. Wikipedia article about Spain's history from ancient times to modern Spain. Provides Internet resources on the History of Spain, whether from Spain and abroad, in Spanish, English and other languages. View from Eivissa (Ibiza Town) towards Playa d'en Bossa holiday resort and the airport in the far distance. The Balearic Islands are an archipelago in the Mediterranean off the coast of eastern Spain. Mallorca, the largest island, is known for its beaches, rampant drinking parties, the picturesque coast and the Serra de Tramuntana mountains in north. the other three major islands are Minorca, Ibiza and Formentera. Online magazine with news from Mallorca and the Balearics Islands. University of the Balearic Islands. The official tourism portal of the Balearic Islands with travel & tourism information on the Balearic Islands. Tourist guide to Mallorca, Menorca, Ibiza and Formentera. Balearic Group of Ornithology and Defence of Nature. Provides information about everything related to Formentera. Online version of the Ibiza Spotlight Island Guide. A touristic travel guide provides informations about the island of Majorca, Balearics. Information about attractions and amenities of Menorca. Hacha Grande, a mountain in the south-west of the island of Lanzarote. The Canary Islands are an archipelago off the coast of Morocco, consisting of several rugged volcanic islands known for their black- or white-sandy beaches. Tenerife, the largest island, is dominated by the active volcano Mt. Teide. The other main islands are Gran Canaria, El Hierro, Fuerteventura, Gomera, and Lanzarote. Capital cities: Las Palmas on Gran Canaria and Santa Cruz on Tenerife. The Island Council of Fuerteventura. The Island Council of Gomera provides information on Gomera. Turismo de Canarias - Tourist information about the Canary islands. Website about the Canary Islands: Tenerife, Gran Canaria, Lanzarote, Fuerteventura, La Gomera, La Palma and El Hierro. They call themself "Spain's leading independent Search Engine & Directory".